Poke the kebab skewer through the hot dogs, and cut slices into them without cutting all the way through, and remove the end pieces. Take the skewers out and bend the hotdogs into circles. Cut 4 circles out of the dough using a ramekin and place a hotdog on each. 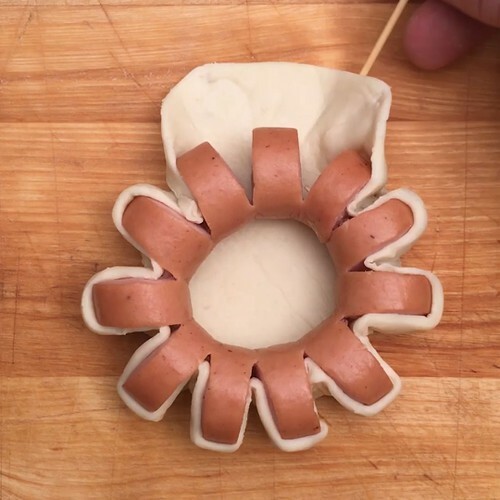 Use a toothpick to fold the dough between the hot dog slices to make small flowers. Add grated mozzarella to the middle of the flowers and season with salt and pepper, then bake for 10 minutes at 180°C on a baking tray. Place an egg yolk in the middle of the flower and bake again for 3 minutes at 180°C. Garnish with chopped chives and enjoy with salad on the side.